A hot topic in biomedical sciences is converting white “bad” fat into brown “good” fat. The latter type of fat is viewed more positively because it seems to be associated with a relatively metabolically more active, leaner state. Could we somehow convert white fat to brown fat and in so doing have a beneficial effect on health? Researchers from the Harvard Stem Cell Institute just came out with some new research on potential stem cell-related approaches to the much-vaunted conversion of white-to-brown fat. 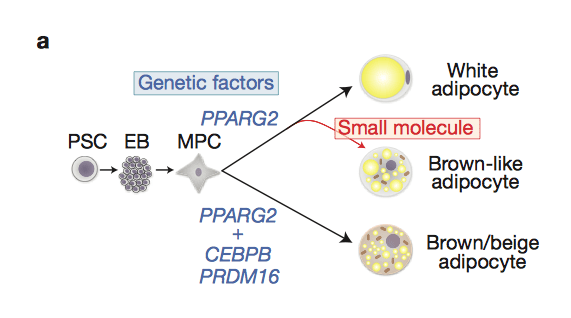 The paper was posted yesterday in the excellent journal Nature Cell Biology from a team led by Dr. Chad Cowan and is entitled: White-to-brown metabolic conversion of human adipocytes by JAK inhibition. The authors conducted an elegant screen (see Figure 1a above) to look for molecules that could shift the fate of fat tissue produced from stem cells toward brown fat. They found so-called JAK kinase inhibitors could do the trick in human cultured cells. A pill coming soon to not just potentially make you healthier by changing your fat, but also to replace exercise? OK, so that’s a clever, rhyming soundbite with “pill” and “treadmill”, but did it go too far? Well, aside from the fact that I’m very skeptical about this to begin with… even if this pill worked (and that’s a HUGE if), it couldn’t replace all of the other benefits of exercise. Thin people who don’t exercise do not live any longer than overweight people who DO exercise (Steven Blair’s research on this question goes back over twenty years.) So statements like the one that Chad Cowan made are actually kind of irresponsible. People don’t need anything else encouraging them to stay seating on the couch popping diet pills. I can see this as an adjunct to proper diet and exercise, but as a replacement? It will never happen. There are other beneficial effects of exercise that will never be provided by a drug. Also, this is just an in vitro pilot study. We know nothing about potential toxicities yet. This sort of hype almost never works out. Gleevec is the one exception that I can think of off the top of my head. The white fat to brown fat transform sounds like a great new way to count calories… Perhaps I’ll finally be able to find my abs!!! But I share your concern about “going too far”. In one corner we have; unnatural lifestyles, advertising, GMO and engineering of manufactured foods that are perfectly designed to make you fat. There is an over-reliance on “scientific and technological fixes” for “manufactured problems”. There was widespread media reporting on a similar concept (but targeting activation of AMP kinase) from Nestle and other companies a few weeks ago. I thought it was April 1 already! Replace white fat (which by the way does actually serve several essential purposes in the normal state) with brown reactive-oxygen generating machines? May be interesting as a therapy for some diseases states but as a lifestyle choice I see a massive inflammatory storm followed by cardiac arrest. And I can get that with a life of steak and chips anyway. How would this JAK inhibition influence other types of fat in the body? Some types of fat are structurally important, like Hoffa’s fat pad. However– if this is true, it will be hugely significant for the field! What a sizable market!